Are you unhappy with the appearance of your nose? Whether you have a bump on the bridge or a crooked nose you’d love to straighten, you can quickly transform your appearance with a nonsurgical nose filler. 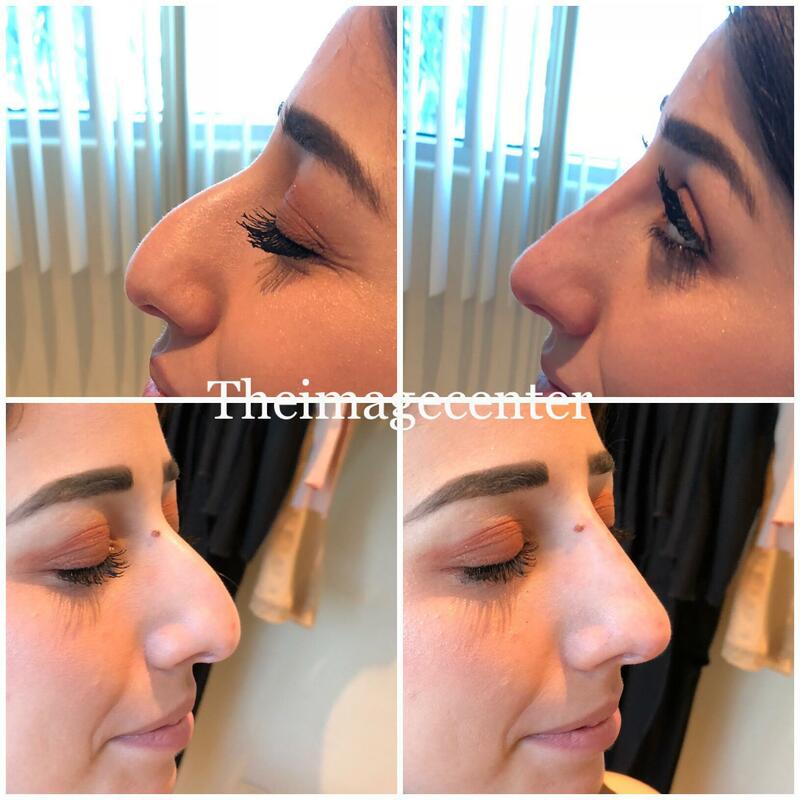 Peter Newen, MD, at The Image Center can improve the things you don’t like about your nose in 30 minutes, using dermal fillers to correct common problems and reshape your nose. To learn more about nonsurgical nose fillers, call the office in Huntington Beach, California, or book an appointment online. Non-surgical chin enhancement is a safe, minimally invasive alternative to traditional chin augmentation with implants. The procedure is designed to enhance the appearance of the chin and the lower face. It involves injecting specially selected dermal fillers into precise areas of the chin to increase its width, length, or projection, using a needle or a microcannula. Treatment is performed with topical anesthesia, and patients experience very little pain or discomfort. With a customized procedure, we have the ability to mold a person’s chin to add definition, create symmetry, and bring the chin into a more pleasing balance with the remaining facial features. Both men and women detest the unpleasant sight of double chin (medically known as submental fullness). So many of our patients have tried everything possible to reduce or eliminate double chin— from facial or jaw exercises, purported to tighten the area under the chin, to surgical procedures. Fortunately, there’s a new way to get rid of the double chin permanently without surgery. Kybella™ is the new FDA-approved injectable drug that melts double chin permanently. It involves a series of small injections that destroy fat cells and tighten up your neck. Once destroyed, the cells can no longer store fat. With Kybella™, you don’t have to carry around that unnecessary extra chin anymore. Whether due to injury, genetics or an unsatisfying previous rhinoplasty the nose can become susceptible to cosmetic concern. Bumps, sunken sections and asymmetry can all play a role in an otherwise unappealing nose. The nonsurgical nose job aims to add symmetry back into the nose by straightening the bridge and nostrils or filling in nasal contours to camouflage affected areas. Dermal fillers are used to enhance the shape of the nose, and each injectable is chosen based on its specific contours. With the nonsurgical rhinoplasty, you receive results almost immediately, and the procedure itself takes less than an hour to complete. The amount of time your results last depends on the type of filler. Some last 12-18 months, while others may last up to five years. It is important to note that the use of dermal fillers in the nose will not impact the underlying structures of the nose. Using injectables simply works with the contours already present on the nose and augments them. Completely re-constructing the nose will require more invasive surgery. Dr. Newen injects the filler so that it softens angles, restores symmetry, lifts or changes the angle of the nose tip, or fills in the area around a bump on your bridge to create a straighter profile. Hyaluronic acid-based fillers, such as those in the Juvéderm (Allergan) and Restylane (Galderma) ranges, as well as Belotero (Merz) are worth a shot when your eyes need a scalpel-free lift. The different variations can be used to smooth fine fines, fill under-eye hollows, and camouflage darkness.Now that there are formulations made specifically for different issues and areas, eye rejuvenation with injectables can be completely customized for the most natural-looking results — and improvement can last for up to a year or more. Kybella permanently eliminates submental fat, which is the excess fat under your chin. The primary ingredient in Kybella is a synthetic form of deoxycholic acid, which is naturally found in your body. Deoxycholic acid normally breaks down dietary fat when you digest foods. When it’s injected under your chin, it breaks down fat cells, then your body naturally clears away the waste so the fat is gone for good. Fat injection refers to a treatment called fat grafting or a fat transfer. During this procedure, Dr. Newen removes fat from one part of your body, meticulously processes the fat to remove cellular debris, then injects the purified fat into another body area. You can expect to lose about half of the injected fat in three to six months. The fat that remains is considered to be permanent. However, all the fat on your body, including grafted fat, naturally diminishes as you get older. As a result, you may need repeat injections down the road. Rhinoplasty is typically done as a surgical procedure to reshape your nose. A nonsurgical rhinoplasty recontours your nose using an injectable dermal filler. If you’re ready to rejuvenate your appearance with a cosmetic injectable, call The Image Center or book an appointment online. If you’d like to improve the appearance of your nose without surgery, call The Image Center or book an appointment online.